Good quality and very soft. Pretty blue. Looks nice and classic. 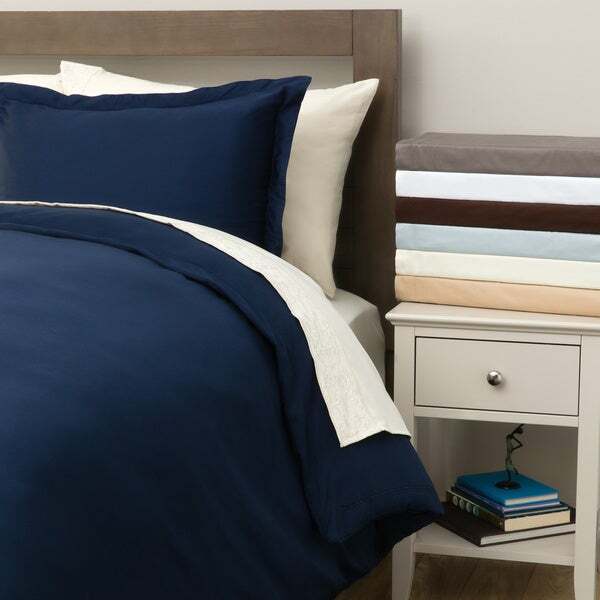 Spruce up your bedroom with a new shot of color and style with this Hemstitch duvet cover set. The included duvet cover and two pillow shams are made of 100-percent cotton in a sateen weave for extra softness and comfort. With a wide variety of colors, consider purchasing more than one color so you can change up the look of your bedroom wheneve you like! This is a beautiful, expensive looking & feeling duvet cover. Fabric has a beautiful sheen & soft drape.. The duvet & sham (I got twin size w/ one sham) are well constructed. Others have noted the willow green being a bit different from what is pictured. I would describe it as a light, sagey green that is a bit brighter and less grayish toned than many ¿sage greens.¿ It is a nice, neutral color that would go with just about anything. You will need to press duvet & sham/s before using as there are significant creases from being folded, plus you¿ll need to press out the flanges that are shmooshed & wrinkly so they¿ll be nicely squared off. The shams are the type that open across the middle of the back (unlike some others that open on the side and have buttons). The hem stitching on the duvet goes on 3 sides (not across the top, where pillows would cover it anyway) of the ¿top side.¿ The top end is where the button closure is The underside is plain, without the hem stitching; there are two potential looks with this duvet ¿ with or without the hem stitching. When I need to wash mine, I intend to launder it in warm water and will always dry it on my drying rack (away from sunlight to keep from bleaching it by the sun). Doing so will prolong the life of it greatly, as being beaten in the dryer is hard on all things. This is my first experience w/ a duvet, but I think I¿ll love it because I love the flexibility of putting a heavy quilt inside or something light for warmer weather, and being able to launder the outer cover. I just read last week that vapors from dry cleaning are potentially unhealthy, so I love being able to wash the duvet cover and getting to protect blankets from dust and body oils, etc. I will note that getting the blanket & quilt inside is quite the chore, but I don't mark it against this duvet: I think it's just the nature of the beast, as they say. Getting the blankets down in there is quite a task. There may be an easier way to do it, but I struggled quite a bit to get mine in. Also, if a person is looking for that crisp, perfectly neat look, I don't think a duvet cover would be a good choice for them because it just has that slightly rumpled look. Sort of European. I am fine with it, but just want to make that point to someone who has never used a duvet cover. I put my willow duvet w/ an ivory colored bed skirt and it looks beautiful. Understated elegance. Looks good, the hemstitching all around is understated but elegant. Just 2 in too long and too wide for my comforter. The set arrived with an odor, so I washed and dried it immediately. Filled it with a light weight 90x95 inch Natural Comfort White Down Alternative Comforter purchased elsewhere and, with just a little smoothing, it looks fine. The cover feels smooth and soft enough. The material is thin. As others mentioned, there are no ties or buttons inside to secure an insert, but so far it is okay. On the other hand, the pillow cases are useless as they are way too short for my 25x16 inch memory foam pillows. I do not think they shrank in the drier but were small to begin with. Although the listed dimensions suggest otherwise, these pillow cases must be for the shorter “standard” pillows. Finally, the white set I received looks like a light ivory next to the bright white Echelon Home Echelon Laguna Quilted Cotton Euro Shams I also purchased here. I can live with the difference since I plan to layer the duvet anyway. I may donate the pillowcases since they are not returnable now. I plan to use the duvet cover, but on its own I do not consider it to be all that luxurious. I was looking for all-white accessories and bedding and looked around quite a bit before I bought this duvet cover set. This was definitely the best value for the money. It feels very luxurious and has buttons one one end so the comforter does not move around and can be adjusted. There is detailing all around the comforter and it looks very elegant and pretty. The high thread-count makes it feel very luxurious and it looks great on the bed. The pillow covers also looks great.Definitely recommend! Ever since I got married, I've been on a mission to create a comfortable, warm bed for myself and my husband. Since we live in the DC area and it gets quite cold during the winter, I knew we would need to buy a down comforter soon. I wanted to get a duvet cover to keep the comforter clean. This set was a natural choice because I also have the sheet set of the same design. I was concerned that the king sized cover would not fit the comforter I purchased, which is 102x86 inches, but it fits fine and in fact there is a little more room on the sides. I was pleased to find sewn-on button closures instead of snaps. One thing that I wasn't expecting is that the shams which are included are king sized pillow shams (in hindsight I should have known they would be). Like the sheets, these do wrinkle fairly easily (more noticeable on the pillows than the duvet cover) but can be ironed out with little trouble. This cover is very soft to the touch and has helped me create the perfect, relaxing, luxurious bed I've wanted. Could not be happier with this purchase! The Full/Queen size is 90"x90". My comforter was about three inches from the edges all the way around. If you don't mind having to pin your comforter in it's fine. The fabric was very soft. I purchased the white twin duvet to cover a white comforter that is 90 x 68. I was thrilled when I read that this cover was 90 x 68. I just received the white twin duvet cover today and the package reads 68 x 88 :o( It looks and feels to be of nice quality. I will see if it fits the comforter I have this weekend, and if not, I'll have to return it. If it does fit, I will write another review letting you know how it washes. I was disappointed that Overstock didn't have most of the color options pictured in stock when I ordered (I originally wanted moss). Of the four colors they did have I chose Willow and am very happy with it. The color looks much nicer than the picture. It's a little greener and with more of a silk-like sheen that doesn't show-up well in the picture. It really looks great and is easy to clean. Cat hairs brush off with just your hand, and my Siberian Husky who is still accustomed to sleeping in the house after a recent surgery, jumped up on the bed with wet, dirty paws the very first day. A wet rag (didn't even need soap) and a few minutes later you couldn't even tell she had been on the bed. My only complaint is that I ordered the full/queen sized duvet/sham set and either the manufacturer mismatched the shams and didn't catch it during QC or the set is supposed to ship with one full-sized pillow sham and one queen-sized sham that's about 1-2 inches larger. If they're going to consider full and queen the same size, which they're not, they should at least plan for the larger of the two sizes. Overall, I'm very happy with the purchase and would recommend it to others. This is my first duvet cover, but it seems of high quality and good value for the price, based on what I've seen shopping around. Hope that helps. You MUST buy these sheets! Get rid of the old and in with the softest most wonderful sheets and duvet set ever! First of all your bed will look like something out of a magazine and did I mention how soft they are?! My reccomendation: Buy neutral colors, I reccomend either white or ivory. White is my personal fav- and you may think White! No way! I have kids and pets, not to mention a husband. Well, ladies, white can be bleached back to beautiful, what are you going to do with a dark orange or light blue? Also, if you use any facial cleanser or treatment with benzoyl peroxide it will bleach the color right out of your pillow cases, even if you rinse it ALL off (just a tip) Enjoy!!! I washed this item before using and it did very well. I loved the quality and the color. It was, however, a few inches larger than the comforter I placed into it. I was surprised by this, as I know it is a TWIN size, and that is what I ordered. However, I am using it, after ironing, and it is beautiful, and feels good. I have been an Overstock customer for quite sometime and have always been pleased with my purchases. Recently, I purchased the Hemstich 400 Thread Count Duvet Set. The color was rich, the fabric soft. I pre-washed the duvet and pillow cases prior to use. If you are planning on putting them in the dryer, make sure to pull them out promptly once the dryer cycle is complete. I left mine in the dryer for a while and when I pulled them out, the fabric was extremely wrinkled. However, once I inserted my quilt inside the duvet and laid it across the bed in a matter of a couple hours, the wrinkles had disappeared! I will continue to purchase from Overstock; 1) because of the quality and money-back guarantee; 2) because of the value...(+ free shipping) you really can't go wrong! I hate Hate HATE buying things online, but this was one of the best purchases I've ever made from the internet. It was plasticy out of the box, and I was upset about that, one wash in the machine though and it was like a feather. Fabric is heavy, and easily cleaned, not so oversized that quilt floats around, perfect. I ordered the white king, and it was cheaply made. There were loose threads, flimsy stitching, and the fabric was horrible quality. Unfortunately, I only received a partial refund when I returned it because I tried it on my comforter. The dimensions were larger than described, and it didn't even fit. What an utter waste. Bought this queen comforter cover in fawn. Out of package, it had a sheen. Disappointing, because I was specifically avoiding sateen. I washed after receiving it. It came out of the dryer very wrinkled and fuzzy - as expected from cheap sateen-imitation cotton. The pillow covers came out distorted after washing, shrunken a bit too. The material is comfortable, but definitely not nice-looking because of fuzzing and extreme wrinkling. Would not recommend this to anyone.The shipping was prompt. I am very impressed with this duvet cover. I needed a duvet cover that could be used daily and withstand repeated washings. This cover is very soft, has minimal wrinkling if removed from the dryer upon the cycle's end and best of all... IT FITS! The insert fits in the corners and side to side well so the duvet just needs a good fluff in the mornings and it settles down nicely on the bed. A Definite Thumbs UP for this item. The color is not what I expected at all. I would return it but don't want to pay the shipping as this was already an exchange. I feel that when I exchange with Overstock I am loosing money continuing to pay the shipping fees. Sorry. I thought the Fawn was much lighter as the picture shows and was more on the Pink sid instead of the gold tones. I bought this duvet in light blue, the color is exactly what I expected based on the photo. There is a stitching design about 2 inches from the edge around the top and sides and I didn't realize it when I ordered it. The stitching design does not negatively impact the look or feel of the duvet cover - I honestly couldn't be happier. The material is very soft and not too heavy. Now that I have this duvet cover, I love my down comforter even more! This duvet set is not something I’d probably purchase again. It’s for a guest bedroom and not as soft as I’d like. The dark color is fairly represented in the photo but for our use isn’t ideal, as it seems to collect and show lint and stray hairs. The detailing is fairly good quality. I’ve washed several times without any problems. I love this duvet! The buttons stay strong! That’s the problem I’ve had with others! I love when I was the set it still looks new! Great feeling when you lay on it. Quality duvet cover. I use it in my down comforter in the wintertime. It feels like a good quality sheet. I layer it with a quilt. Beautifully made, fabric was heavier than I expected it to be. The cover has a luxurious feel and looks beautiful in the guest bedroom. Very pleased with this purchase. not what I was expecting in term of quality but I guess you pay for what you get. The delivery was fast. Duvet is fine, the fabric is decent quality and buttons have not yet fallen off unlike some other comforters I have. Giving 4 stars as the seam at the top could have been a bit tighter. No issues, but when you pull the fabric you can see between it. We've had this duvet cover for 4.5 years and it has held up well. It's been on our bed non-stop among 3 kids and 2 dogs. The simple pattern is nice around the edges and it washes well. It would be even better if it had duvet ties. "Does the duvet have corner ties to keep the comforter from moving around?" No, and it is a pain in the rear. I'm thinking I am going to sew some in my self. In fact, it doesn't fit well at all. We added a topper and we have a king bed so nothing hangs over the sides. very frustrating! Thank you., your answer was very helpful! "Has anyone ordered the gray color? It looks taupe on the color chart." "Would someone who owns or has seen in person the "fawn" color please describe it? I'm looking for a dull gold beige-ish hue with no pink undertones. As an aside, it'd be wonderful if the site would provide at least approximate Pantone color matching for items such as these where it's difficult to discern true color due to variations in lighting, monitor color reproduction, etc." "Do you have a queen size in white? thank you!" Unfortunately, we currently do not have this set in a queen size white option. "Hello, I got this set in white a year ago and absolutely loved it! I want to get the same set but i don't see a white color option anymore . Please help!!" The colorways we currently have available can be found listed in the options drop down menu. We restock items as they become available; however, we cannot guarantee an item will be restocked. I have an oversized California king down comforter and there is room left over in the duvet. I love it. Long enough to hang over the sides and bottom of my bed. I ordered a queen for my queen duvet and it fits perfectly. Love this set! The twin-size duvet cover measures 68" X 90" and my twin-size comforter measures 68" X 90".